Military Miniature Flags make a perfect way to add that special touch to your military events or to decorate your spaces. Tuff Flags offers a complete set of 6 miniature flags in the size 4"x6" of all the military branches including the Army, Marine Corps, Navy, Air Force and Coast Guard apart from the US national flag. These make wonderful desktop accessories or book case display. Show your pride in the military forces with these finely crafted shiny rayon flags. These high quality flag sets come with a polished gold spear head and base.Shop from our complete line of Military Miniature Flags right away and avail the best prices, quick shipping and much more! 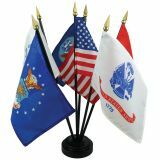 Our Military miniature flag set is great for both home and office display. Show your pride in the US military branches with this set of 6 polyester flags,- one each for the 5 military branches and a U.S flag as well. The flags are mounted on black staffs and finished with a gold spear top. Show your respect for the American military force and your national pride alike with these Military Miniature Flags. These are great for Independence Day parades and other events as displays. The Military miniature flags from Tuff Flags are the best way to honor the world’s greatest military and will match with any interior theme or setting. The flags made of premium quality rayon are perfect for long term indoor display and short term outdoor display. Shop at ease for these Military Miniature Flags or should you need any suggestions, call us at our toll free number (888) 287-3524 or email us at customercare@tuffflags.com.